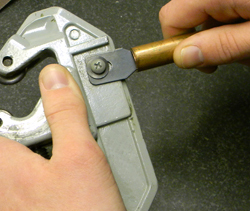 1 Use a reamer to remove all burrs and to smooth the cut edges of the copper tube. 2 Proper cleaning of the copper tube requires an abrasive cleaning product such as sandpaper, a wire brush, or an emery cloth. 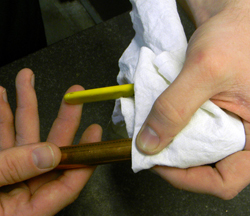 Once the copper tube has been cleaned, wipe it with a clean cloth to remove excess grit. 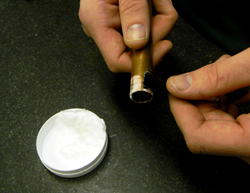 3 Apply a quality flux (water soluble, tinning flux) to the outside of the copper tube and the inside of the copper fitting(s). It is important to apply the flux completely around the tube and the inside of the fitting, as leaving a “dry spot” will result in a leaky joint. 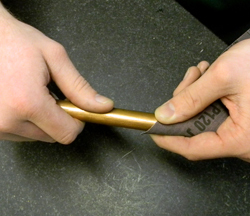 4 Applying the proper heat to the joint and evenly distributing heat around the joint is critical to ensuring a successful solder joint. 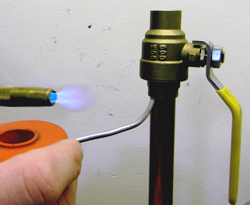 Use of a quality no-lead plumbing solder, with a wide temperature range, and moving the torch around the fitting, will help ensure a solid, leak free, connection when completed. Remember – YOU MUST HEAT AROUND THE ENTIRE FITTING – move the torch to prevent overheating and ensure proper heat distribution. 5 After the joint has cooled (let the joint cool “naturally”, do not use cool water) wipe the joint with a damp rag to remove any excess flux. Should you have further questions regarding soldering and fluxing no-lead brass material products, please consult your A.Y. McDonald Representative or contact our customer service department at 1-800-292-2737. To download a PDF of this bulletin, please .